Administration – love it or hate it – it’s got to be done! And according to Colin’s strategy explained in previous blogs, it is an essential tool to being a successful artist. Deciding that his time was better spent DOING art, he recruited me to do the admin and I am writing this blog to outline the necessities. Assuming most creative people are right-brained, they tend not to be organized like left-brained people. So they end up in a mess, up to their ears in receipts and burning the midnight oil doing their tax return and completely stressed-out. Following a few simple steps could resolve this situation – and I promise you don’t have to be organized – or spend a lot of money on expensive computer software designed for the art world. You probably have everything you need on your smartphone and even if you don’t, there is free stuff you can download to help you. So decision #1 – are you going to do it yourself? If so, see part 2 of this blog where I make some suggestions for a simple system. If not, outsource! Find a Virtual Assistant. 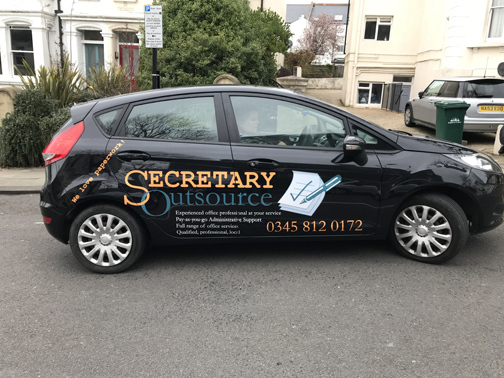 There are thousands of people like me who work on a freelance basis to help sole traders do the admin for their business. They don’t have to work on-site like I do for Colin either – the wonders of technology can overcome this. For as little as £25 per hour, a VA can take away the worry of filing your receipts and leave you free to be creative! Is your time better spent doing that or tearing your hair out over paperwork? And once organized, they may only need an hour or so per week! A VA can access your system remotely* and log your receipts that you have taken a photo of and uploaded into a file. Similarly, any sales invoices you generate when selling your artwork can be uploaded and at the end of the financial year you will have the money in/money out figures to complete your tax return. Some VA s will even complete your tax return as well, as long as you provide them with the relevant documentation. Did you know you can claim an allowance against tax if you work from home? This covers heating/lighting/insurance etc. Speak to a qualified bookkeeper or Accountant for advice. In part 2 I will outline some very simple tools to help you do it yourself. In part one I outlined the benefits of outsourcing your administration/paperwork (whatever you want to call it) to a VA, unleashing you from the drudgery of sweating over a computer, to be creative. However, if you decide to do it yourself then all you need is an Excel spreadsheet to log money out and money in, plus another one just for sales. Don’t have Microsoft Office? You can download free software from Libre Office which will provide something very similar. Devise a system that works for you to keep your receipts. We are all different, so a one-size-fits-all approach won’t work. How about 12 envelopes (one for each month) in which to put your receipts? Or a plastic folder (one for each month) within a binder? Shoe boxes, a hook on the wall – whatever suits your lifestyle and your personality. Then put a reminder on your phone for the first working day of each month to log the receipts for the previous month into the spreadsheet. Taking 2 hours per month is much easier than 24 hours at the end of the year! Yes I know you creative people find it hard to be that disciplined – but taking one morning a month will save you SO MUCH time, effort and stress when you try to do your tax return – I promise it will be worth it. Or how about doing it once a week? Every Saturday morning or Wednesday afternoon? The title of this blog was inspired by the fact that I started working for Colin on Wednesdays and so that day became admin day. Get into the habit of saving receipts for EVERYTHING. Don’t do contra deals – that makes life VERY complicated and could potentially mean you don’t end up claiming for expenses that will reduce your tax liability. Money in, money out and log your sales. Keep it simple.